Home Strategies What Tactics Can Retailers Use to Drive Customer Loyalty? What Tactics Can Retailers Use to Drive Customer Loyalty? 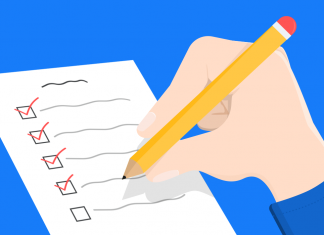 In this post we’ll look at how retailers can use a variety of tactics to improve customer retention rates and encourage customers to keep coming back for more. Once you’ve converted visitors into customers, the next key challenge is to keep them happy and encourage them to come back and buy again and again. For different sites and products, the importance of loyalty and challenges of driving repeat business will vary. For example, a product like a washing machine will be purchased less often, and retention is more of a challenge. Loyal customers are often the most profitable segment for any business. Indeed, research has found that repeat customers spend 67% more than new customers. It therefore makes sense to identify these customers and segments so their behavior can be understood and rewarded. Recency. This is a measure of how fresh, or recent interactions with . customer are, and helps you to distinguish between active and inactive customers. Frequency. This measures demand by seeing how often a customer interacts with a retailer. Monetary value. How much they spend. The theory behind this is simple enough – customers who have made a purchase recently and frequently spend more than others are more likely to buy again. 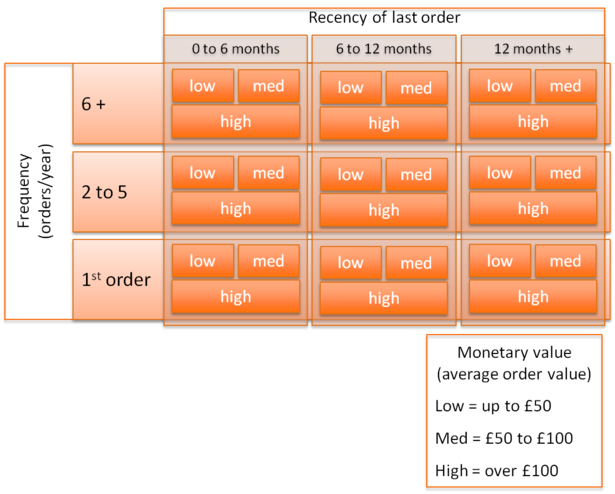 This model can also help to identify customers who are beginning to buy less often, and may need to be tempted back with an offer or two. If your most loyal customers feel valued then they’re more likely to keep coming back, and there are several ways to reward them. Loyalty schemes can help a retailer to identify and understand their loyal customers, and the data you acquire about customers can be used to further improve their experience. The best schemes offer clear rewards for frequent purchases such as special offers and exclusive deals. They should be easy to understand and use, as there are many competing schemes around. 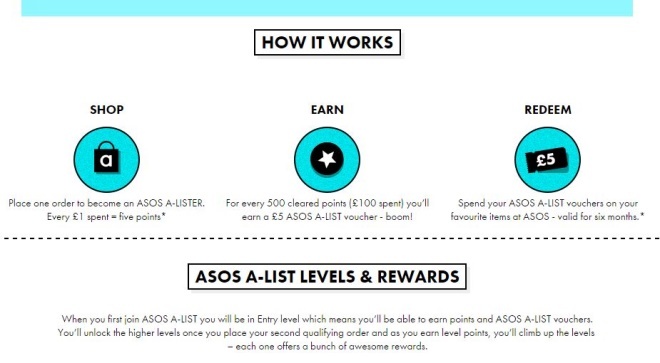 The ASOS A-list reward scheme is a good example, with clear and worthwhile rewards for repeat purchases. Data obtained from loyal customers, whether through loyalty schemes or shopping and browsing behavior can be used to reward customers by giving them the best possible experience. For example, online supermarket sites can identify customers’ most frequently purchased items and use them to make more precise recommendations, or to save them time on repeat visits. Emails can also be personalized, to make product recommendations and offers more relevant and useful for recipients. 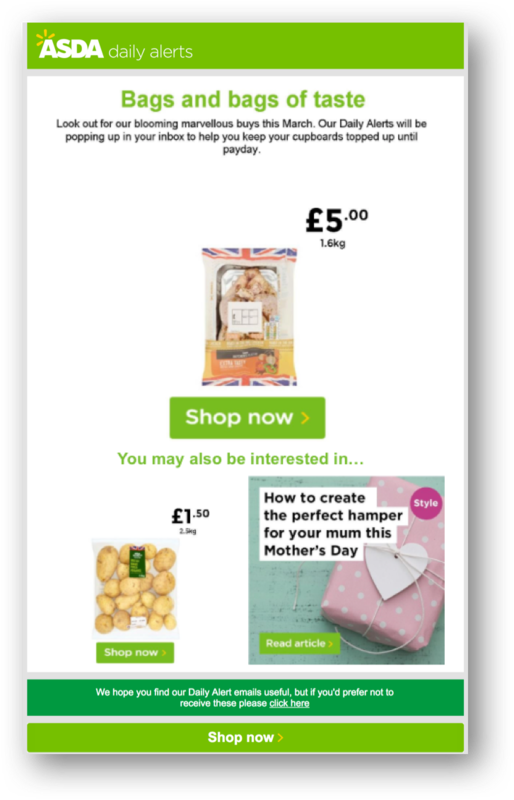 Asda’s Daily Alert emails are a great example of this. They’re automated emails, with the products displayed chosen according to the recipients purchase behavior. 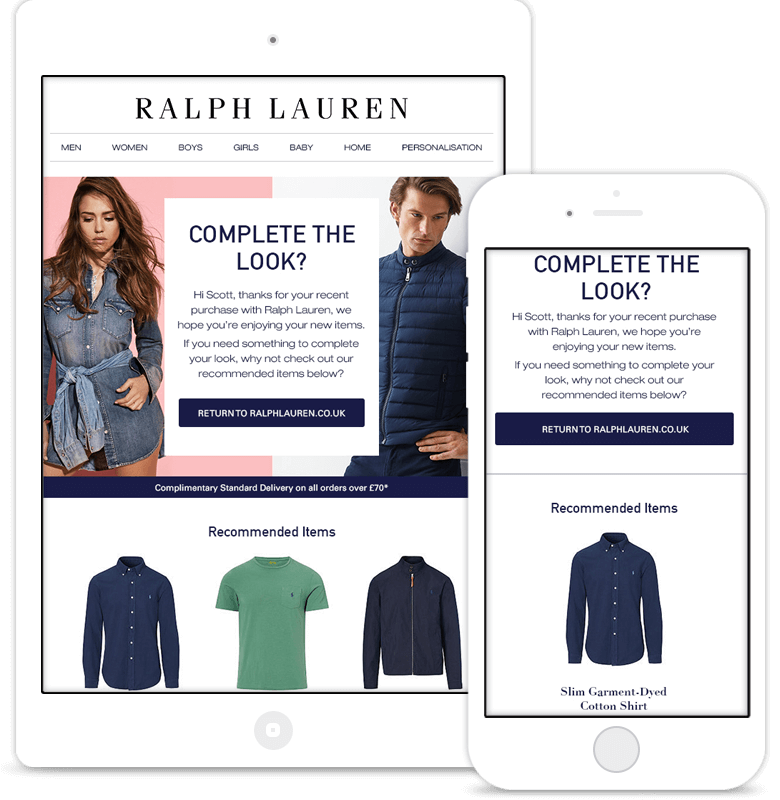 Once a customer has made their first purchase, email can be used to build and maintain a relationship with customers that can persuade them to keep coming back. A strong post-purchase strategy can reinforce the good vibes from a purchase, keep your brand in their mind, and drive repeat purchases. These could be replenishment emails, which prompt customers to re-order an item, order confirmations, notices of sales, or relevant product recommendations in upsell and cross-sell emails. According to an American Express survey, 58% of consumers are willing to spend more with companies that provide excellent customer service. If you offer customers the best possible experience, and your service from purchase to delivery and beyond is great, people are more likely to shop again. This means a good online experience, with a website that’s easy to buy from, to delivering items as promised, and dealing effectively with returns and other customer service issues. For example, Amazon values customer service, and makes the returns and refunds process easy for customers. Sometimes, it doesn’t even bother asking for returns, as in this example. It’s a little touch which leaves the customer happy by saving them the effort. According to Harvard Business Review, 23% of customers who had a good customer experience told more than 10 people, meaning that great customer service can help with acquisition as well as retention. Next articleHow Does Google Chrome’s New Ad Blocker Work?